Similar to the USA, people immigrate to Ivory Coast because it is the economic success story of West Africa. Ghana people move to Ivory Coast, it is estimated that 25 percent of the people in Ivory Coast are immigrants; this causes many problems for the present election. The ink proves she has voted, and stops people from voting twice. I took this photo of my neighbor Angel in Grand Bassam, she was proud to show she had voted, they locals will pull out their very modern identification and voter registration card and shows you, there is nothing primitive, this is cutting edge technology. "The man in charge went to Abidjan." Last night for about two hours they count was read off on the radio, the sound of a hard and raspy man read the country from districts in Cote d’Ivoire. Laurent Gbagbo - The current President has 35 percent. Alassane Quattara has 35 percent. Henri Konan Bedie has 27 percent. The story goes something like this, if there is not a simple majority, whatever that means… then the top two candidates will have a run-off vote on November 28, 2010. "Enter Ivory Coast at your own risk, and your insurance will not be valid." Our election was yesterday in the USA. In order to vote you must have a picture ID, proven place of residence such as drivers license or certified ID card. We had a new group called the TEA Party in on the election this time. On and On the phone has rang for months asking us to vote for so and so, TV is covered with rumours and dirt on each other. Door to door politics every day of the week. Billions of dollars spent and for very little good. When they get their office if the republicans say yes the democrats day no and if the democrats say yes the republicans say no and the Tea Party stands on the lawn with signs and chants. Oh Well, at least it is over until the presidential election. Sorry to sound to down in the mouth but we all wish these politicans would remember they work for us with super good pay and lots of benefits and it is time they do they job so we can trust them with the welfare of our country. 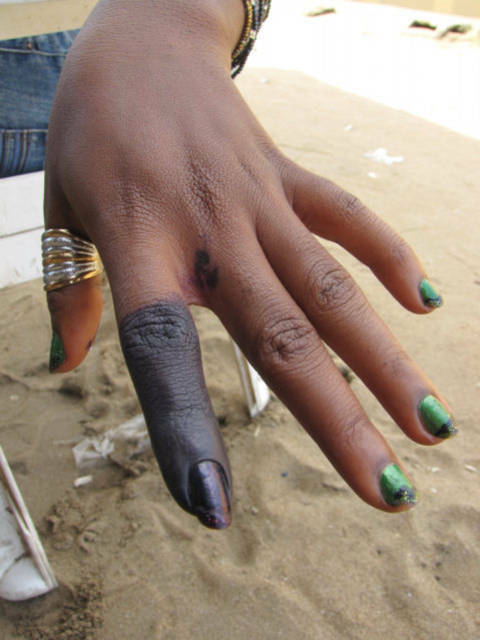 The black ink to say, "I voted! look at me" sort of like all those silly buttons in the USA. Though an excellent idea to prevent fraud. Very difficult to fake or fool. Too bad 99 of voter corruption comes from higher places in the authority structure.